Hi there! This is another mani I did not too long ago. For this mani I painted my nails with Revlon Colorstay 090 Sorbet (2 coats). I’m not a big fan of the colour orange, but this is, without doubt, my favourite orange polish because it’s a great base colour for stamping (evidence here and here). However, this time I didn’t stamp. 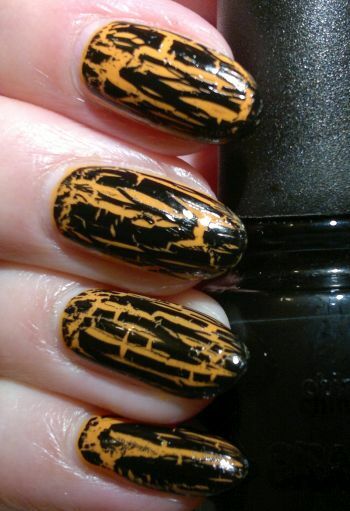 I found a few special effect top coats in my stash, like this one – China Glaze Black Mesh. A few years ago this kind of crackle or shatter top coat was the rage. I didn’t care for these top coats, but when they hit the Poundstores, I picked up a few colours to play with.